The scout wasn't backing down. In five years, he said, the best player from the 2010 NBA draft won't be John Wall. "In five years," the Eastern Conference scout said, "Paul George will be the best player to come out of this draft. Unless you're a well-studied draftnik or hail from Fresno, Calif., chances are you haven't heard too much about George – if you've heard of him at all. That's OK with George. He's about to go from relatively anonymous to relatively rich on Thursday, when he's projected as a possible lottery pick in the draft. And if you listen to the 20-year-old George – who clearly isn't lacking for confidence – his climb toward stardom won't end there. "I feel like I have all the intangibles, all the tools to be one of the best players not only in this draft, but to play in this game," George said. "It's something I'm really taking to heart. My dream is to not only get drafted – that's a goal of mine – but my dream is to someday be a legend at this game. I want to work to be that." Before George elevates himself to legend, he'll need to introduce himself to NBA fans. George grew up in Palmdale, Calif., in north central Los Angeles County. Among the past and present notable residents listed on Palmdale's Wikipedia entry are John Wayne, Marion Jones and Debbie Rowe, the former wife of Michael Jackson. Craig Brackins, the junior Iowa State power forward who is projected to go in the draft's second round, also is listed. As of Tuesday morning, George wasn't. George, who grew up as a fan of the Los Angeles Clippers, not the Lakers, averaged 25 points and 12 rebounds as a senior at Knight High School. 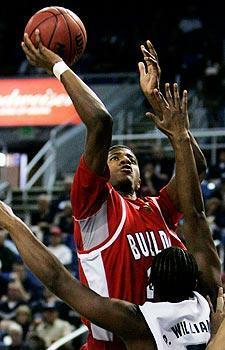 He received scholarship offers from Georgetown and Penn State, but instead chose Fresno State. The decision paid off when he received enough playing time to average 14.3 points and 6.2 rebounds as a freshman. By the time George's sophomore year arrived, NBA scouts were already familiar with his athleticism and ability to play all three perimeter positions. One scout likened him to Tracy McGrady(notes) in terms of skills and demeanor. Listed at 6-foot-8 and 215 pounds, George averaged a team-best 16.6 points, 7.1 rebounds and 2.2 steals while making 90.6 percent of his free throws as a sophomore. But he also averaged 3.2 turnovers and was inconsistent, scoring more than 20 points in nine games and fewer than 10 in four others – including a scoreless performance against rival San Jose State in front of several NBA scouts. The Bulldogs finished just 15-18 and didn't play past the first round of the Western Athletic Conference tournament. "He could be the best in his class," a Western Conference NBA scout said. "He can also be the biggest bust, too. He went to Fresno State, but he didn't set the place on fire. I question whether he understands what it takes to be a star, but I'm not saying he won't." Said an Eastern Conference scout: "Scoring comes easy to him. If he played with a high motor he'd be top five. But even at his pace, he does a lot of things easy." Those scouts aren't the only ones to question George's energy and effort. It sounds as if he's aware of the criticism as well. "At this next level," he said, "you have to bring it every night." Along with George's versatility and athleticism, his size and length have helped him move up draft boards. He stands nearly 6-9 in shoes and his wingspan measures 6-11. Every lottery team from eight through 14, with exception of the New Orleans Hornets, has worked him out. "I'm just showing my full capabilities," George said. "I'm showing I can defend. I have the ball-handling to make plays. I'm showing everything that I couldn't show at Fresno and didn't show. I think that's really what is catching their eyes. I can be a complete package." Apparently, a few other people think so too. George received one of the NBA's 16 invites to sit in the green room on draft night. His father, Paul George Sr., had promised to come to New York if George received an invitation. The elder George is scared of flying and wanted to save his first flight for something special. This qualifies. "For him to take that flight to New York to get to see me in that moment, that would mean the world to me and my family," George said. "I got so much riding on this. I got the whole city of Palmdale supporting me." George isn't the only player in this year's draft who either starred at an unheralded program or was obscured by the depth on his team's roster. Here are nine more who figure to shed some of their anonymity on draft night. Ekpe Udoh, Baylor, PF-C – Scout's take: He doesn't have a huge upside, but he is a quality big man who should be a solid pro for a long time. Might be the oldest player drafted at 23. A possible top 10 pick. Luke Babbitt, Nevada, SF – Scout's take: He's a highly skilled offensive player and scorer. Has good size and can rebound. Athletic, tough. Can play both forward positions. Will need to improve defensively. Larry Sanders, Virginia Commonwealth, PF-C – Scout's take: He's long and athletic. His tremendous wingspan helps him as a shot-blocker. He's only played the game five, six years. Has an average back-to-basket game. Eric Bledsoe, Kentucky, PG – Scout's take: Lost in shadow of John Wall and DeMarcus Cousins at Kentucky. Decent shooter and defender. Tough, but will need to play point guard. Dominique Jones, South Florida, SG – Scout's take: Might be draft's biggest sleeper. Combo guard. Aggressive scorer. Tough physically, mentally. Good athlete. Not a playmaker. Big question: What position is he? Solomon Alabi, Florida State, C – Scout's take: Smart player, but his game – both offensively and defensively – is still raw. Has extremely good size. This is a gamble pick. Kevin Seraphin, Cholet (France), C – Scout's take: Effort-type big man with good hustle and energy. Somewhat undersized at 6-9. Cut in the mold of Paul Millsap(notes) and Brandon Bass(notes). Should be drafted in the 20s. Hassan Whiteside, Marshall, C – Scout's take: Raw, shot-blocking big man who has risen from obscurity. Good athlete who can run the floor. There are questions about his knowledge of the game. Tibor Pleiss, Brose Baskets Bamberg (Germany), 7-0, 220 pounds – Scout's take: Could drop to the second round and play overseas next season. Nice body and skilled, but not ready to help an NBA team now.